Welcome to the Bramatha website. I hope you will enjoy browsing and please go to the contact page and tell me of any changes you think would enhance the site. My thanks have to go to Kim who has been very patient in helping to create my ideas into this site! It has taken a lot of talk over the years for us to join the 21st century and the .com world! 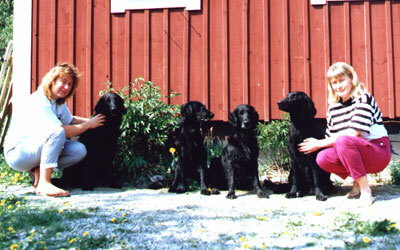 The aim has been to create a site with lots of Flatcoat information and the all important pictures to give you an idea of the history of the breed, not just about Bramatha which has had a major role in establishing the Swedish flatcoats. For those of you who are new to the Bramatha and Sarah Whittaker we have been around for long time! Bramatha is based in the heart of rural Suffolk on a farm where we can all run freely and splash around in eight ponds! Bramatha dogs are all around the world in a variety of homes, some as companions, others as police dogs sniffing out drugs, some being shown, others out tracking or finding game in the hunting/shooting field, this is just a few of the activities the Bramathas are enjoying! Today the kennel is very small with Sarah sharing her time between: her husband Paul, who is often the photographer; son Robert, who is "the apprentice"; the dogs, who enjoy going to the occasional show and out shooting during the winter; and her work as a farm secretary and trainer of business accounts. Like so many people, Sarah started off with one dog, Stonemeade Prince Charming, which was a gift from her Father, Philip Whittaker of the Stonemeade kennel. Over the years the kennel numbers have peaked into double figures, but for the foreseeable future they will stay with just the select few. See Articles for more information. The liver coloured flatcoats have always been very special for Sarah, with Atherbram Ability (Sara) being the first to come home. Sarah first judged in 1983 and has been honoured and privileged to judge in the UK and overseas, there are some exciting appointments to look forward to when Sarah will hopefully catch up with some old friends... and see some interesting dogs... See The Judge for more information.